I have grown to appreciate Yom Kippur over the years. Part of that is due to eliminating caffeine-withdrawal headaches. And fasting is much easier than, for example, in my first year in grad school, when I fantasized about what flavor ice cream I’d get at the new Baskin Robbins and what snacks would be good to stock up on for studying in the first year grad students’ room. The Yom Kippur War was also that year; we got news bulletins during services. While there is a lot about those years in the Boston area I’d rather forget (like most of grad school), I look back appreciatively on the first Orthodox Yom Kippur Hillel services I attended. They were led by an organic chemistry grad student named Aryeh (I don’t recall if he was a rabbi yet) and an Israeli named Bezalel. Bezalel’s voice may have been average, and his Middle Eastern style of chanting may not have won him a spot at your typical suburban synagogue, but he chanted not only accurately but with intense kavanah (mindfulness while praying), literally setting the right tone for the day: serious, but hopeful. And of course nothing was cut out. By the time we were reciting the Amidah for the fifth of five services, I felt as if I’d run a marathon: worn out, but in a good way. Not that I’ve ever run a marathon myself, but you get the idea. Anyhow, the morning Torah readings include the Yom Kippur activities of the High Priest (Leviticus 16:1-34) and the obligatory sacrifices (Numbers 29:7-11). The people were so joyful when the High Priest came out of the Holy of Holies and announced they’d been forgiven that the rest of the day became a time for finding mates and announcing engagements. As I noted this summer (https://igplotzk.wordpress.com/2013/07/19/vaetchanan-deuteronomy-323-711-shabbat-nachamu-4/ ), Mishnah Taanit 4:8 states that on Tu B’Av and Yom Kippur “the daughters of Jerusalem go out dressed in white and dance in the vineyards. What they were saying: Young man, consider who you choose (to be your wife).” Appropriately, the afternoon Torah reading, Leviticus 18:1-30, is about forbidden sexual relationships. The morning haftarah, Isaiah 57:14-58:14, is complementary to the ritual-filled morning Torah reading. Isaiah does not reject ritual, like fasting, per se, but ritual must not be an end in itself. It must spur the right behavior, like feeding and clothing the needy. The afternoon haftarah is the book of Jonah (and Micah 7:18-20, which we just read for Ha’azinu and Tashlich). Is this a fairy tale? Slapstick? A parable on responsibility and the efficacy of atonement, emphasizing the universality and compassion of the Lord? Probably all three, but remember from school that, in multiple choice tests, the longest answer is usually right. 7. On Yom Kippur you don’t drink and after Purim you swear you’ll never drink again. 5. In both stories “Winning the lottery” is actually a death sentence. 4. Heck, the whale threw up Jonah. 3. The phrase the “The whole Megillah” was made for Yom Kippur Services! 9. Instead of Atonement, G-d offers consolation prize: free month Jdate membership. 8. Cantor warns congregation of the possibility of him including some “Explicit Lyrics” in this year’s Kol Nidre. 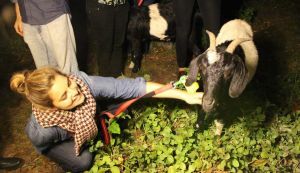 eScapegoat, a new web app from G-dcast, a fast-growing San Francisco-based Jewish educational media production company, is helping some of us overcome our sheepishness. 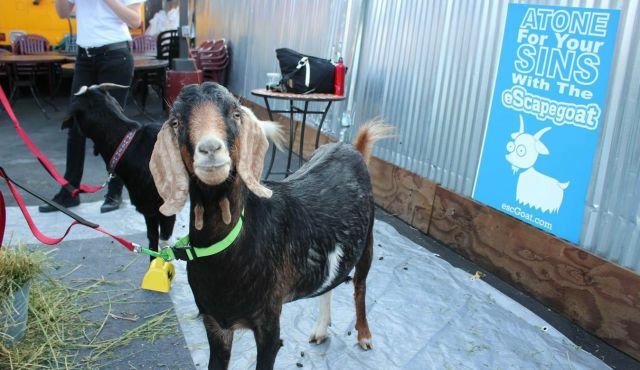 SAN FRANCISCO – If you keep an eye out, you’ll notice a goat wandering around the Internet. This being the Jewish season of repentance, it isn’t just any goat. It’s an electronic scapegoat onto which computer and smart phone users are unloading their sins in a virtual reenactment of the ancient Yom Kippur ritual described in Chapter 16 of Leviticus. While we may be reluctant to own up to our misdoings, it seems that eScapegoat, a new web app from G-dcast, a fast-growing San Francisco-based Jewish educational media production company, is helping some of us overcome our sheepishness. G-dcast makes self-reflection easy. If you can tweet, then you can atone. All you need to do is go to escgoat.com and read short texts on the biblical scapegoat story and how it relates to today’s observance of Yom Kippur. Then you enter your maximum 120 character-long confession and post it anonymously. You just type and click your way through the initial stage of atonement. “It’s just like the bible, only nerdier,” the on-screen text tells us. There is, however, one major difference between then and now. In biblical times, the sins cast onto the scapegoat only went as far as the animal made it in the desert before dying. With this cyberspace-dwelling cartoon goat, our sins could live on forever, having been broadcast out to the world through eScapegoat’s (lightly moderated)@SinfulGoat Twitter feed…. On the whole, Rabbi Lawrence Kushner, scholar-in-residence at San Francisco’s Congregation Emanu-El, is a fan of G-dcast’s creativity. But he, like Booth (Rabbi David Booth, senior rabbi at Congregation Kol Emeth in Palo Alto, California), has reservations about the virtual scapegoat. Patrick goes into the confessional box after a long lapse from going to church. Inside he finds a fully equipped bar, Guinness on tap and a row of decanters with fine Irish whiskey. On the wall is a dazzling array of cigars. “Father, forgive me, for it’s been a long time since I’ve been to confession, but I must admit that the confessional box is much more inviting than it used to be. The priest replies: “Get out, you moron, you’re on my side”. …When it comes to biblical humor, we miss the point. In fact, we mostly miss the humor. …Humor informs biblical texts. To miss the humor of the Bible is to miss not only much of its fun, but much of its meaning. Take, for example, Jonah. Every scene in this prophetic book invites a smile – the picture of the reluctant prophet, for instance, fresh from the belly of the whale: reeking of whale vomit, trailing seaweed and barnacles and old fishheads, bleached of all his color by gastric juices, robe shrunk up to his knees and elbows, way bad hair day, not only disheveled but seriously disgruntled, trudging ornery into Nineveh muttering his message of doom in a language the Ninevites can’t even understand. Scenes like that dominate the book. The first chapter alone sets up enough ridiculous situations for a Marx Brothers movie. God orders: “Go east,” Jonah goes due west, as far as he can. God threatens Jonah with a “mighty tempest in the sea, so that the ship was like to be broken” [1:4]; Jonah, unfazed as a five-year-old, remains “fast asleep.” God gets into a water fight with Jonah just so He can rescue him. And the means of that rescue? Angelic life preserver? Submarine? Trained porpoise? Nope: the distressingly uncomfortable and disgustingly smelly “belly of the fish” [1:17]. From its opening parody of the prophetic call to the final picture of those “much cattle” [4:1] penitently attired in sackcloth and ashes, Jonah is a funny book. And the funniness matters. The humor in Jonah is not incidental, not superficial decoration. The humor is not only fun, but functional. There is a moral to the Jonah joke. …The first thing we see in Jonah is a parody of the prophetic call. Prophetic convention dictated a certain shy reluctance in responding to the Lord’s call: Even the great Moses tried to get out of being prophet on grounds of stuttering. But when the Lord calls Jonah, he refuses to answer at all. This entry was posted in Uncategorized and tagged atonement, confessional, eScapegoat, fasting, High Priest, Isaiah, Jonah, Kol Nidre, purification, Yom Kippur. Bookmark the permalink.